It is not every flight where the captain speaks in Norse. Yet it was Norse from the captain on the intercom our Iceland Air flight, followed immediately by a translation in English. Nor is it every flight where the flight attendants walk up and down the aisles anxious to hand out the latest copies of local paper in Reykjavik, Iceland (written in Norse, of course). From the moment we boarded our Iceland Air flight from Baltimore to Reykjavik, we had a feeling we were not in for a standard airline flight. It takes an international flight on a foreign carrier for us Americans to realize just how dramatically our domestic airline industry has declined over the last couple of decades. For all the nice words that you hear on American airlines about how much they appreciate your business, you are treated like cattle. I suspect the service we have come to expect on American airlines would rate internationally as a C or a D.
I would like to report extra legroom in the economy class on Iceland Air, but it was as tight back there as in any American airline I have flown. Norse Class (their business class) looked much more inviting: each seat came with a personal DVD player. Otherwise, there was little to complain about during our trip on Iceland Air to Paris, via Reykjavik. Dinner was served shortly after our 9 PM departure. Warm rolls from the cabin’s oven were passed out in a basket for us to enjoy with the meal. The dinner itself, which was not large, was surprisingly tasty. The flight attendants were multilingual, extremely courteous and made numerous trips up and down the aisle offering hot tea or coffee. The flight attendants were also overwhelmingly young, female, attractive, thin, blonde (like I assume most Icelanders) and impeccably well groomed. They seemed less concerned about saying all the right words before takeoff and landing, but did check to make sure we were securely in our seats, had our bags properly stored and had our seat backs straight up. Whenever they talked in English, they sounded decidedly continental. The lounge music used before takeoff and landing may have been a bit bizarre, the animation showing us how to buckle our seat belts and don oxygen masks a bit lowbrow, but otherwise it was an enjoyable flight and by American standards, classy. We left Baltimore at twilight and took the Great Circle route to Iceland. In case you are wondering, this is northeast. The airline provided complementary earphones for those who wanted to watch the movie. Steve Martin’s version of Cheaper by the Dozen was not my cup of tea, but it was apparently uproariously funny to many passengers. I made a futile attempt to doze but their laughter and the bright cabin lights destroyed any possibility of sleep, despite my forethought to bring both earplugs and blinders for my eyes. Our plane flew north across the St. Laurence Seaway, northern Quebec and Newfoundland. 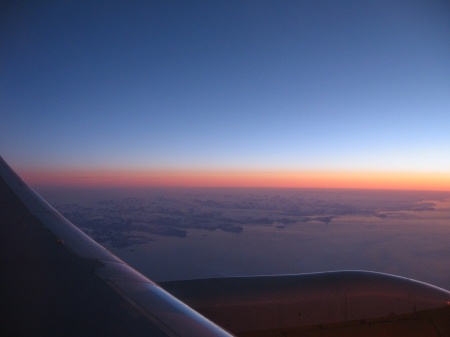 By the time that we passed over Newfoundland, what passed for our short summer night had ended. It was a little after midnight in Baltimore but there was already a rosy glow on the northern horizon. We passed over the Labrador Straits and brushed the southern tip of Greenland. Greenland is an island so far north and so remote that I figured I would never see it in my lifetime. Yet there it was out the port windows in the early dawn. It was not the least bit green of course, but riveting nonetheless, as the picture shows. Looking at just the tip of this glacial world from our airplane filled me with a sense of awe. I have heard climatologists warn how much sea levels would rise if the glaciers in Greenland melted, which sadly appears to be well underway. I now appreciated just how much water that is, and was staggered by the volume. The skies remained clear and the day brightened as we approached Reykjavik, the capital of Iceland. In early July, there is no night in Iceland. Before we knew it our five hour flight was over, and we were deposited at Keflavik International Airport, which is somewhat west of the capital and next to the northern Atlantic Ocean. Through the airline window, I caught my first close up look at tundra in my forty-nine years, parts of which were alive with a purplish flower I could not name. In the distance, the occasional thermal vent threw up steam into the atmosphere. Although practically at the Arctic Circle, there is outdoor swimming in Iceland near some of these thermal vents. It may have been just a little after six a.m. in Iceland, but there were many customs officials on duty to handle the influx of Iceland Air passengers. Most were from the United States. (The early flights were mostly for passengers traveling east.) Iceland Air, as you might expect, carries the bulk of air traffic in and out of Iceland. The customs officer solemnly stamped our passports. Afterwards we were forced to go through their airport security. This seemed pointless since we went through security in Baltimore, but we were not in a position to argue with another sovereign government. The terminal in Keflavik International Airport is relatively small as international airports go, modern and could have used more seats, particularly near the gates. We were able to purchase bottled water with American dollars in their duty free stores. We puzzled over their restrooms, which were peculiar by American standards. It took me a full thirty seconds to realize you had to press a big white button behind the toilet in order to flush it. This was just one of many small adjustments that I would need to make to adapt to life on the continent. Our time in Iceland was short, and we were soon on a connecting flight to Charles de Gaulle International Airport outside of Paris. This flight included brunch. There was little to see and no sleep to be found on this flight. Clouds covered the northern Atlantic and the east coast of Ireland. It was not until the pilot announced we were over the English Channel that we knew Paris was not that far away. Our daughter, who had the window seat, gazed down on France in a daze. Going to France was her consuming passion all year. Our trip was her reward for a year of hard scholastic work. Yet rather than look excited she seemed dazed. Our lack of sleep made us all feel dazed. Our landing was smooth and the weather was sunny and hot by Parisian standards. Charles de Gaulle airport lacked some of the comforts we expected in American airports, like a fully functioning air conditioning system. Its architecture was modern by the standards of the 1960s, but looks shopworn now and is in places quite dirty. Your shoes will likely stick to the tiles. Moreover, the French seemed in no hurry to connect us to our baggage. It took more than an hour and many false attempts before our baggage lackadaisically arrived at baggage claim. Unlike the Icelanders, the French had no desire to stamp or even look at our passports. Fortunately, our driver was waiting for us in the arrivals area. We blearily followed him up a packed elevator to a minivan that took us to our hotel. While my wife and daughter dozed in their seats, I tried to appreciate this very old, but for me very new country. Although our driver only spoke Pidgin English, it was better than the half dozen or so words that I knew in French. It was the middle of a Thursday afternoon in Paris. I quickly discovered they had serious traffic in Paris, just like in Washington. Apparently, gasoline at 1.45 euros to the liter did not discourage drivers: the roads were congested. By American standards, the traffic lanes in Paris were narrower. Cars were not afraid to get within inches of each other in heavy traffic, nor to muscle ahead of each other. Yet it was done in a benign and almost polite way. Those on a motorcycle or motor scooter were of the opinion that lanes were for cars only, and happily weaved between car lanes as suited their convenience. Outside I could see the Parisian suburbs, which had something of a second world look to it. There were many tall apartment buildings, with clothes hanging off the balconies. I assume this was where the many “guest workers” of French Muslim decent lived. Apparently, one must traverse inside Paris’ version of the beltway before you feel like you are in the classic Paris. Finally, around 4 PM we were deposited at our hotel, the Best Western Nouvel Orleans at 25 Avenue Du General Leclerc, deep into Paris’ Left Bank. We were sweaty, stinky, dehydrated and desperate for a bed. We rested for an hour, but evening was already approaching. Seeing sights would wait for tomorrow, but it was too early for sleep. We found a tiny Pizza Hut takeout place just fifty feet from our hotel window. With our daughter and French student acting as our translator, we were able to order a pizza, consume it indelicately in our room and shortly thereafter crawl into bed. The sun had not yet set and it would not be fully dark until around 11 PM. The sound of motorcycles accelerating very loudly and rapidly came through our open windows, which we needed open to cool the room. For this night at least we were impervious to the noise and even the inadequate air conditioner in our room. We slept around the clock but awoke rested, over our jet lag, and ready to engage Paris.